Oh, I'm so glad he's all right. Bloat is really frightening. Whenever it is Goliath's time, you'll have a lot of your blog sisters & brothers crying with you, my friend. I had to let my sweet guy go almost a year ago (old age...) & I still miss him. XXXXXXXX to Goliath! Stacey, This post made me cry. I can actually feel your emotion, your love for your first boy when I read your words. I'm so glad Goliath is home again and doing better. I'm glad it wasn't his time yet. I guess he has a little more love to share and I know you do too. Hugs for you and pats for Goliath. Hi Kathi, thank you for the sweet words and I'm sorry for your loss. Never let anyone say, it was "only" a dog. They just don't get it. FBG! Yes, it's amazing really. I think we instinctively pick up when one of us isn't able to move forward. That's the beauty of some relationships and I'm very fortunate to have it. Thanks for reading and writing. Hi Nancy, you dog lover. You get it. I understand he's not getting any younger, I can only hope when his time comes, it's peaceful. That's why the other night was so unbearable, it was far from peaceful. But, we don't always get to choose, do we? Thanks for your lovely comment. I'm so glad Goliath is OK. What a sweet, beautiful, loving dog. I'm glad you got to the vet in time. My lab mix has a big, deep chest and a tiny waist. Bloat is always at the back of my mind with him. He likes to race around like crazy and I know it's better to keep him calmer after meals. 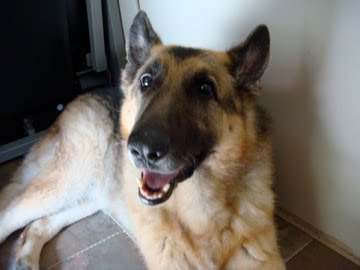 German shepherds are wonderful dogs.